Carpal tunnel syndrome information. 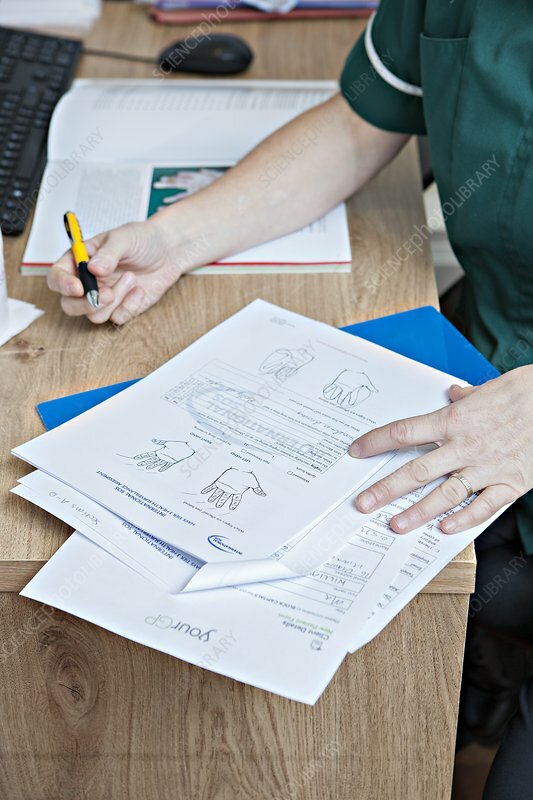 Notes and diagrams being used by a paramedic at a general practice (GP) clinic during a consultation with a patient who has symptoms of carpal tunnel syndrome (CTS). The paramedic is explaining the condition and what treatments are available. This condition is caused by the median nerve from the arm being trapped by bones and ligaments in the wrist. It can cause pain and numbness in the fingers, and can affect hand and wrist function. In severe cases, the ligament trapping the nerve may be surgically cut to treat the condition. Photographed in Edinburgh, Scotland.